Lately I’ve seen a lot of authors sharing their own lists of personal tips and tricks for winning at life – or life hacks. This got me thinking about the things I do to keep my life on track with my goals, both personal and professional. Maybe some of these can work for you, too, whether you’re an author or not. Here are mine! I live in Austin, which has the 4th worst traffic in the US. Especially before I started my new day job 5 miles away from my home (which still takes 30-45 minutes some days), I spent a LOT of time in my car. Chances are, you probably do too, and if you’re an author, you sometimes get your best ideas while you’re stuck in traffic or flying down the highway, when it’s least convenient to pull out your Moleskine and jot the idea down before you forget. How I combat this is to keep a dry erase marker in the car and scribble the ideas on the window (usually in short hand). A nice bonus – you can also take down license plate numbers of law breakers instead of trying in vain to commit them to memory. Everyone benefits from being well read, but no one benefits more than authors do. Reading more makes you a better writer, but it’s hard to find time to read between career, family, and extracurricular duties. I’ve found that I read more when I make my reading complement these duties, not replace them. Spending an hour in your car every day? Putting away a week’s worth of laundry? (Doing anything you’d really rather not be doing?) Listen to an audiobook. Hitting the elliptical machine at the gym? Waiting for your doctor to show up for your scheduled appointment? Pull out your e-reader. Trying to sleep and instead letting your mind race? Open a paperback. When I started reading across these 3 platforms, I found I read twice as many books that year than I did the one before it. Make time to exercise. Period. No excuses. Endorphins are nature’s anti-depressants and you can still do wasteful things like binge watching Breaking Bad while working out (but you can also read a book). Life is short, but it’s even shorter when you’re unhealthy, and it’s my experience that running a great writer’s block buster. This is a tough one for me. I read something that pushes all my buttons and raises all my hackles, and I can’t just stop at the end of the article; I scroll on down and start reading the comments to see what other people think. Why do I do this? I don’t know that I can pinpoint a reason other than that I am a masochist. I don’t particularly care about the opinions of complete strangers, and I hate being reminded of how ignorant, hateful, and rude people can be behind the anonymity veil the internet provides. 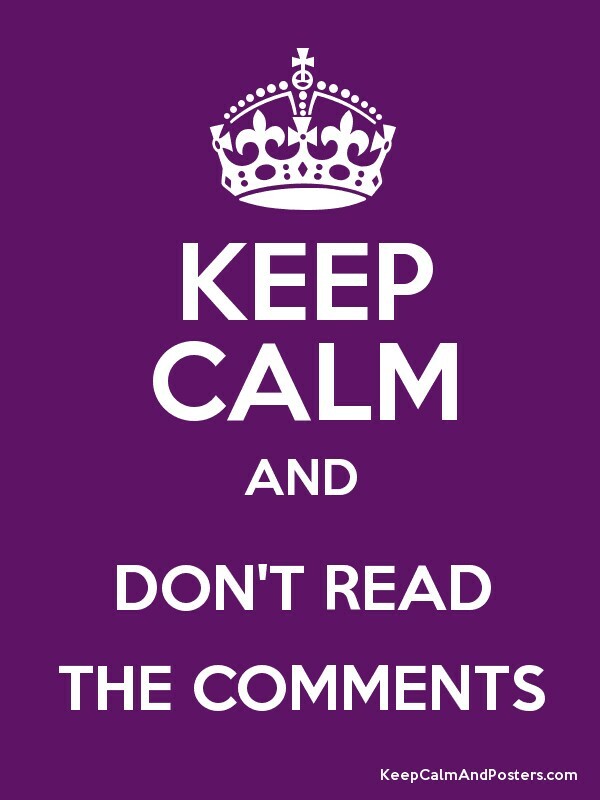 As such, I’m making a concerted effort to #dontreadthecomments (except those on my own posts and sites, of course). Right now I am writing a book that primarily takes place in the gym, so when I am writing, I put on the cheesy upbeat mashup music my cardio kickboxing instructor plays in class to get me in the right mindset. Whatever you’re writing about, pair some thematic music to go with it. If nothing really matches, I recommend Groove Salad on somafm.com. It’s a great downtempo station that will keep you in the zone while you crank up the word count. I’ve been guilty of bringing my work home with me, usually because I was taking on too much and was already doing the work of two people. I don’t have those jobs anymore, because I place too much value on keeping my professional and personal lives separate. I’ve always had a work laptop specifically designed for portability, but that doesn’t mean you can’t leave it at the office. For me, having my work laptop at home in the evenings is too much of a temptation to work ahead when I should be working on something personal, spending time with my family, or joyfully wasting time. Now I only bring it home on the weekends in case something happens (like ebola) and I have to work from home. Unless you have to or are expected to. If your day job doesn’t come with the expectation that you be available 24/7 and respond to every email immediately – don’t. Say it with me now – it can wait ’til morning (or Monday). Your evenings and weekends are yours, not your employer’s. If you’re anything like me, you check personal email on your phone obsessively enough as it is, you don’t need work email invading your personal life, especially when half the emails are auto-generated crap you batch delete on Monday morning anyway. Anyone who’s ever worked in the restaurant industry has had this mantra permanently etched into their being. As much as I hated hearing it from front of house managers who let the most infinitesimal amount of power go to their heads, it’s true. You’ll spend less time cleaning if you can fit in loading the dishwasher while you’re waiting for that water to boil, wiping down the bathroom counter while you’re waiting for the shower water to warm up, etc. Clean as you go, and you won’t have to go clean later. Or not as much, anyway. That’s for my life hacks! What are yours? Remember, time you enjoy wasting isn’t wasted time.